Why do some domain name investors make hundreds of thousands of dollars a year in profit, while other domain name investors lose money on their renewals every year? It’s all because of the domain names they buy. And I was thinking about how I could boil this lesson down into the most simple, straight-forward statement of the difference between successful and unsuccessful investors. Successful domain name investors buy domain names that other people want. And the converse, of course, is true too: Unsuccessful domain name investors buy domain names that no one else wants. Let me give you a visual, because it’s not binary. It’s not just “good or bad domain name” but a graduated difference between domains people want and don’t want. Visualize a funnel of sales inquiries. A funnel is wide at the top and narrow at the bottom. In the sales process at companies, the marketing department is responsible for bringing as many potential customers as possible to the sales funnel. As they’re going down the funnel, most customers will not be interested in the company’s offerings. But at the bottom of the funnel are the few sales prospects that are interested and are most likely to buy the company’s product or service. In order to maximize sales, you want an efficient sales process in the funnel, but you also want as many potential customers or prospects at the top of the funnel. The sales funnel applies to domain names too. But the funnel is made of segments. The first funnel segment is when you — the domain name investor — think of a domain name to register or purchase that you believe other companies might want to buy. You think it’s a good domain name but you don’t base your decision on any data…just your gut feel. In this case, your domain name is likely only registered in the .com top-level domain, the most valuable top-level domain. But what if you did a search and found that the domain name was registered in 140 different top-level domains. Now you can see that there is a lot more interest in the domain name, because either other companies or investors saw the value in the second level domain and registered it. Either way, there’s more interest in this domain name. That’s the middle layer of the funnel, and it increases the top of the funnel and allows more potential buyers to flow down to the bottom. So in addition to you thinking the domain name has value, there are a host of other people who also think the domain name has value and have spent money to register it in other top-level domains. But wait, what if there were a bunch of companies that were using domain names similar to the domain name you registered or purchased? Yet again, in addition to you thinking the domain name has value, and in addition to there being a host of other people who also think the domain name has value and have spent money to register it in other top-level domains, now there are a bunch of companies that are using sub-optimal domain names in — for example — companies who have prepended or appended words like “my”, “group” or “inc” into their domain name. That’s the top layer of the funnel, and — again — it increases the top of the funnel and allows more potential buyers to flow down to the bottom. AND, that top segment of the funnel likely includes the most valuable potential buyers — those with a company and money to buy your domain name. Domain names that only cover the bottom of the funnel will likely cost an investor less than domain names that cover the bottom, middle and top of the funnel. But with education, perseverance and hustle, you can find some great deals…like domain names that cover both the bottom and middle segments of the funnel for only registration fee. Or domain names that cover all areas of the funnel, but are under market value. Successful domain name investors buy domain names that other people want. That means they buy domain names that cover the entire funnel. Want a list of ways to search for companies that may want to upgrade to your domain name? Make sure you’re subscribed to the DNAcademy YouTube channel, then click the link below this video on YouTube and I’ll give you a free checklist download so you can work your way up the funnel and buy domains that more companies want. Very well explained. Loved it. Thank you, AbdulBasit. That means a great deal coming from you. Excellent explanation of why so many of my domain names don’t receive any offers. I’ll definitely be looking for more domain names UP the funnel! Awesome. I look forward to interacting with you on the inside! I think it’s important for all new investors in the industry to understand the basics you covered in this video. It could save investors thousands of dollars by following a simple check-list and conducting proper research before clicking the “BUY” button. Thanks, Eric. I appreciate you watching and taking a moment to post a comment. 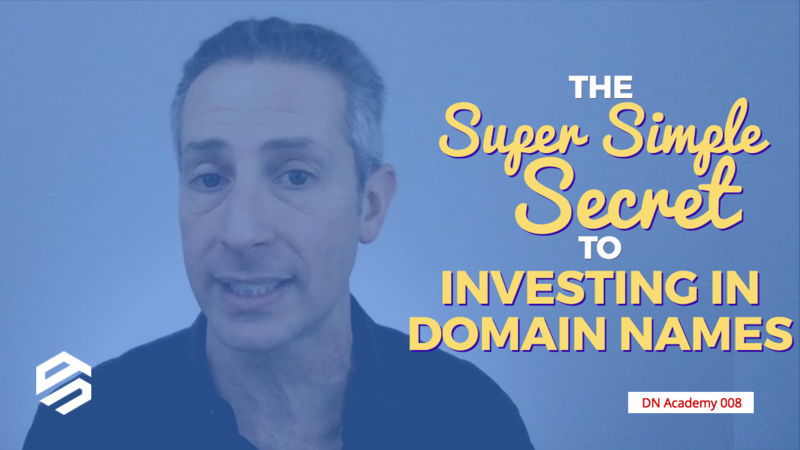 It’s easy for successful investors to say “buy good domain names” but understanding what makes people/companies want to buy domain names is the key. I hope this helps newer investors understand a bit more. Most of the sites that tell you that they will give you all the secrets of the industry and you will be a pro in a month are scam. But coming to domaining i would not trust any other platform than Michaels to get real useful info. Michael summed up all the things i learned in 4 years in a 4 min video. Investing is hard work, and requires a lot of time to learn. I hope my short videos will help a few people reduce the number of failures they make along their journey (we all make failures, right?). I appreciate you taking a moment to post a comment and your thoughts. I’ve been to that site about 3 times never signed up because of the advertisement blocks. For the past 2 months I have been looking for a site like zfbot to know what other tld’s have been registered. Personally, I think the advertising is pretty minimal at ZFbot.com. It’s a free service, so I don’t mind it. There was a comment on https://www.dnacademy.com/check-which-tlds-are-taken, and Vishal said he uses DomainPunch. I have yet to try it out, but look forward to it. If you get a chance to try it, reply to this post and let me know what you think — please. Great tool suggestion, Demyan. I wasn’t aware of it. Thanks for your comment! Absolutely! When I look at a name I ask myself, “who (end user) would want this name?” It’s pretty simple really. Great Information about Domain investing. it is just like a Real-estate, older domain do tend to keep their value, only good one’s produce result, I am investing in domains from last 15 years, now I feel, it is the time to reap rewards, this is my first contact with you, I value you opinion and guidance thank you . Thanks for the interesting read about domain names. I didn’t know that it’s possible to find some good deals on domain names and that you can get ones that other people would want. It definitely sounds like it could be good for any starting up business to research and learn more about domain names so that they know more about what would be beneficial for them to get. @ScalableDomains hand registered ChangeManagementCertification·com and flipped it for about 10x the cost within a few months with a few outbound emails.